I'm going to keep my opinion in check about the undiscovered misguided citizen in this story. The senseless and unlawful injury and or killing of harmless wildlife is very upsetting to me. Thanks to the pizza delivery man, Erik Odegaard, who stopped and did the right thing. Also, thanks to Laura Kelly of Pet Emergency for posting a reward for the shooters capture. The picture is from the Anchorage Daily News. Check this link for the full story of this senseless killing. 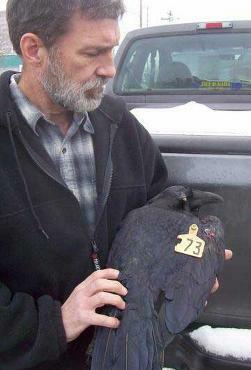 Shooting a raven violates the federal Migratory Bird Treaty Act as well as state law, said Steve Oberholtzer, assistant special-agent-in-charge for the U.S. Fish and Wildlife Service in Alaska. Someone found guilty could face a $10,000 fine and jail time. If you have information regarding this, please call U.S. Fish and Wildlife, Law Enforcement at 786-3311, or the Dept of Public Safety, Alaska Bureau of Wildlife Enforcement at 907-269-5511, or call Alaska Fish and Wildlife Safeguard at 1-800-478-3377.